To improve socialization and communication of adult individuals with aphasia, while ultimately enhancing their quality of life. 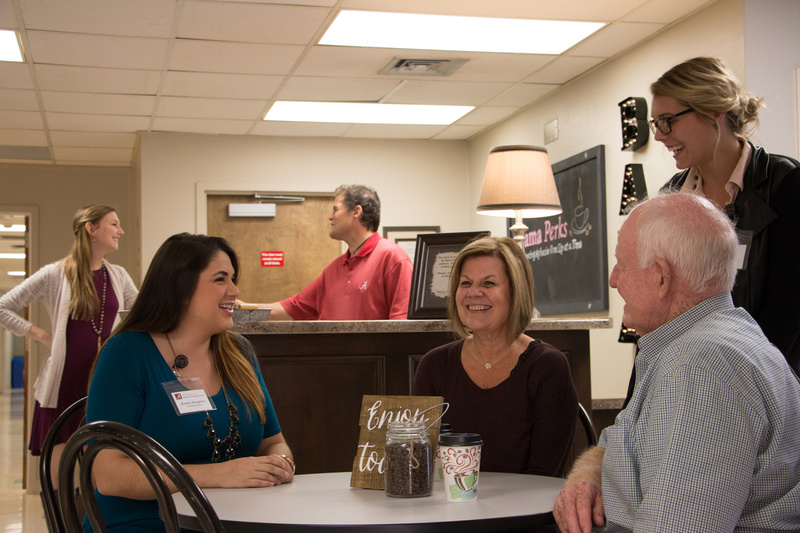 Bama Perks Coffee Shop is a simulated social environment created within the Speech and Hearing Center with a focus on promoting socialization and communication among individuals with aphasia. The coffee shop is open to adult clinic patrons with neurogenic communicative disorders. Individuals are able to come to the coffee shop, order coffee, and engage in casual conversations with other patrons and graduate student clinicians, all while building connections with one another that foster client confidence in community participation. The coffee shop is staffed with undergraduate and graduate student clinicians. The students serve as communication partners to the clients attending Bama Perks. The coffee is free of charge to adult clinic patrons and student clinicians working in the coffee shop.